Passover begins Friday night, April 19, and if you observe the Passover holiday (8 days) you won't be eating any leavened food products. So in terms of chocolate baking you need to tweak some things, starting with not using flour. This doesn't mean you can't have Chocolate Cake, Brownies, or Cookies.. just an adjustment. And, if you're gluten-free, you'll love the first recipe. Baking without flour shouldn't be a problem, and these recipes are great any time, not just for Passover. Because you might be baking dessert for a Seder, whether you're Jewish or not, you'll want to be sensitive and bring a Kosher for Passover dessert. That means not using flour and probably using margarine (or oil as in one of the following recipes) in lieu of butter unless you know the seder meal won't contain meat. I prefer using butter in most of my baking, so this is a hard one. However, if you plan to have sweets around at home during the Passover holidays or just want to make some new Brownie recipes, you'll love these recipes. So for Passover week, here are 4 different recipes for Passover Brownies. Think of them as Flourless Brownies! You love Flourless Chocolate Cake, right? Try all the recipes and let me know which you like best. 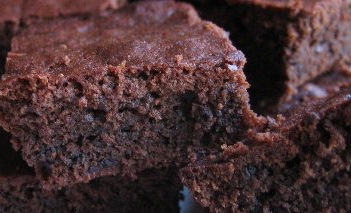 Do you have your own favorite recipe for Passover Brownies? Be sure and share by linking below. These first two recipes I adapted from recipes I found on Chowhound in 2008. Cream butter and sugar together. Mix in egg yolks. Melt chocolate over double boiler (or over saucepan over saucepan with simmering water). Cool and add to butter mixture. Add finely ground almonds. Pour into 9" square greased baking tin. Bake in a preheated 350 oven for 45-50 min. Sift matzo cake meal and cocoa together and add to mixture. Fold in nuts and mix thoroughly. This third recipe is originally from Gourmet 2000 ( Epicurious). It calls for a Chocolate-Wine Glaze, and you might want to try that. I like my brownies unadulterated, but I've tried the chocolate-wine glaze, and it's delicious. Nothing quite like chocolate and Manischewitz! Preheat oven to 350°F. Line bottom and sides of a 9-inch square baking pan with wax paper or greased foil. Melt chocolate and margarine (or butter) in metal bowl over saucepan of simmering water, stirring until smooth. Remove from heat and cool 5 minutes. Beat eggs, sugar, and salt in large bowl with electric mixer on high until pale and thick. Beat in chocolate in 3 batches on low speed. Stir in zest, matzo meal, and nuts just until blended. Spread batter in baking pan and bake in middle of oven until firm and tester comes out clean, 25 to 30 minutes. Cool in pan on rack, then invert onto a platter and remove paper or foil. Preheat oven to 350. Grease 8-inch square baking dish. Melt chocolate and butter in double boiler or in saucepan on top of another saucepan with simmering water. Set aside to cool slightly. In mixing bowl, stir together cake meal, cocoa powder, and potato starch. Combine eggs, granulated sugar, and vanilla in large bowl. Beat with electric mixer until light and creamy – about 3 to 5 minutes. Beat in chocolate mixture until smooth, then add cake meal mixture, beating on low speed just until combined. Batter is thick. Fold in chopped nuts and spread in prepared baking dish. Bake for 25 to 30 minutes or just until entire surface has puffed slightly. Brownies will still be moist in center. Remove from oven and cool before cutting into squares. I especially love Passover Brownies #4--very, very fudgy!!! Of course, I use very good chocolate! It really makes a difference!! !